How many times have I passed Lagunitas Brewing Company American craft beers on the shelves of the local beer stores? Too damn many to count. It seems like I get myself all excited about the limited releases (am I a bit of a band wagon jumper? ), forgetting about the quality year round or seasonal releases that I have never tried. Lagunitas is probably one of the most affordable American craft beer brewers with most of their bombers in the $5.00 range; can’t beat that. It was time to give IPA Maximus a try. Maximus is exactly what you would expect from a west coast IPA: pale and crystal malts forming that backbone that a big rush of pine and citrus hops are built on top of. The nose carries well with the flavor carrying a bit. Pine hops in the beginning with the end finding grapefruit hops that linger while bittering in the finish. You can’t wrong with this beer as the it is just as good, if not better, than beers twice or more the price. After having IPA Maximus, I have decided it is time to frequent Lagunitas brews a bit more over the next 50 days of my 365 American craft beer jaunt. Enjoy! Useless Fact: Anatidaephobia is the fear that somewhere in the world, there is a duck watching you. Thursday night get together have been sparse in the month of May but Rich and Steve made it out to kick off June. Much better. I have always had the opinion that the more guys that can make it the better. This gives us all a chance to taste and try more American craft beer; what could be better? 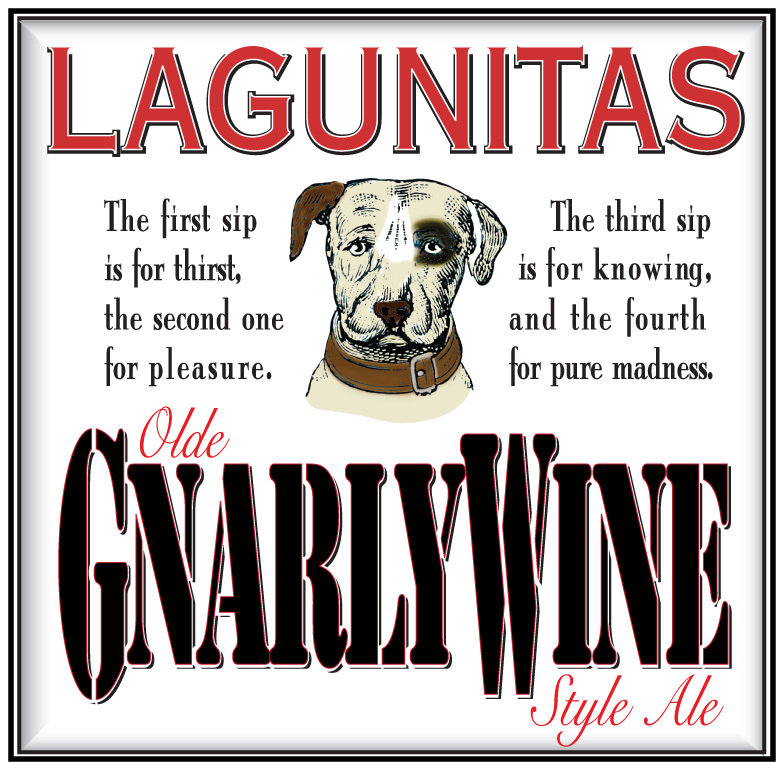 I picked up Olde Gnarlywine by Lagunitas Brewing Company a few months ago. I have wanted to review this beer, especially fresh, so that I could experience the hop profile fresh. Steve has another bottle that he is going to cellar for a year so we can sample the beer with some age also. In spite of trying to have this beer fresh, I would say some of the hop profile has fallen out of the beer. It seems that it was grapefruit while the there is a big, chewy, thick toffee and butterscotch sweetness. The amount of sweetness keeps this beer from really being an easier drinker. Enjoy! Useless Fact: In sixteenth- and seventeenth-century Peking, one took revenge against one’s enemies by placing finely chopped tiger’s whiskers in their food. The numerous infinitesimal whisker barbs would get caught in the victim’s digestion tract and cause hundreds of painful sores and infections. It seems that American craft beer is showing up in bars more regularly these days. Beer bars have a list, similar to wine, of their beer offerings: American and foreign. Last night the wife said she would pick me up from work with the kids and we could have some dinner in the city (Chicago). I figured Jak’s Tap would be the easiest: we had been there before, has light traffic on Fridays, we all liked the food, and had a decent beer menu. Now I say decent in terms of the beer menu because I only want American craft beer and that list is maybe 25 beers on tap. Not shabby, but most of these beers are geared towards trying to turn your macro drinkers. 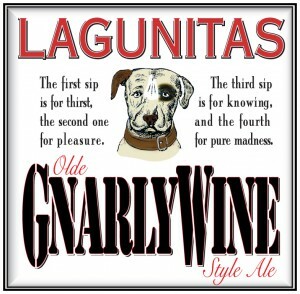 Our server mentioned that Lagunitas Brown Shugga’ was a special at $4.00 a pint for the evening. How could I go wrong as I have never had the beer and beer on tap is darn tasty? Brown Shugga’ has a heaping helping of brown sugar, malt, and, as I found out in the nose, a delicious helping of citrus and pine hops. The hops come through late in the taste and help to balance. The alcohol, which is at a dangerous 10%, does not even appear anywhere in the beer. Not good when you think how easy this beer is to drink. Enjoy! Useless Fact: Most elephants weigh less than the tongue of the blue whale.